Braises, a favorite of everyone during the colder months, are actually quite versatile. Not only that, but they truly get better after cooking and sitting in your fridge for a couple days. This is my current favorite way to highlight bayleaf, my favorite aromatic. You can substitute the chicken for almost any other protein. A pork shoulder would compliment the flavors delightfully! In a heavy bottomed skillet over medium-high heat toast the bayleaves until charred and peppercorns until aromatic. 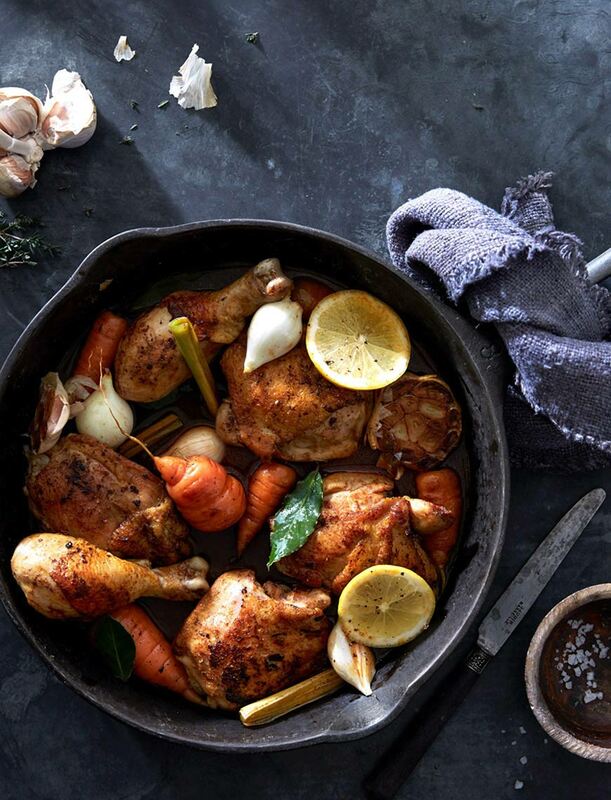 In a large cast iron skillet or dutch oven, heat 1 tablespoon olive oil over medium heat. Season the chicken liberally with salt and pepper and the paprika. When the oil is shimmering and almost smoking, add the seasoned chicken skin side down and sear until golden brown- about 4 minutes. Turn the chicken and cook for 2-3 minutes. Add the apple cider vinegar, making sure to scrape up the brown bits from the bottom of the pan. Add the the chicken stock, roasted garlic and lemons and cover the pan with a lid or foil and move to the oven. Braise for 25-30 minutes before adding the prepped vegetables and thyme. Make sure the vegetables are covered in the braising liquid. Braise for another 25-30 minutes or until the meat is cooked through and the vegetables are fork tender. Serve immediately with mashed potatoes or your choice of side.